Perfect size for making Kombucha - can make a decent amount and the full jar is still manageable. Four in the box. I was looking for something airtight for my smelly skunk beans this might be just the thing. Great sized jar for fermenting my water kefir and storing my crop of Madagascar Beans. Great for bulk canning, fermenting, dry storage, cookies, candy and terrariums. Often used for pickles, pickled eggs, kombucha, and various bulk storage items. Wider than wide mouth home canning jars (86mm), these jars take 110mm closures. Takes Lid 110mm CT. Lid colour may vary according to availability, please contact us if a particular colour is required. 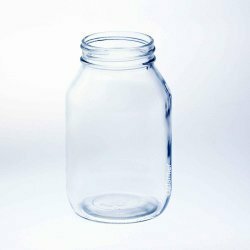 Large size loop jar / growler suitable for a range of liquids including beer, cider, kombucha, vineg..